This is good scissor skills practice for kindergarten children. Don't worry if the flowers aren't cut out perfectly. There's an easier version that has little flower "coins" (circular) that is simpler for younger children to cut out. Alternatives: instead of using the template and scissors, you can use a flower shaped scrapbooking punch to make your flowers. Cut the center out of the paper plate to leave a round "donut" shape. This will form the base of the wreath. (This may require adult assistance). Print out the template pieces - you may wish to print 2 or 3 copies of the template depending on how full you want your wreath to be -- we used two templates for the one in the photo. Color the flowers and/or sunshines (if using the B&W version) -- or you can print the B&W version on colored paper. Cut out the template pieces. This will take quite awhile -- you can provide assistance if you like (depending on the patience of your child). 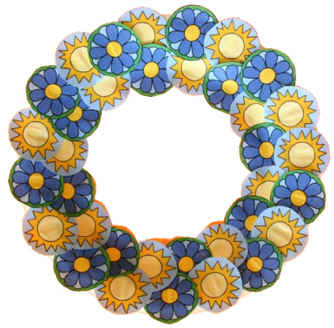 Glue your paper flowers and sunshines to completely cover your paper plate "donut". You can tie a bow from ribbon and paste it on to decorate further. You can do these as a group with younger children -- let each child cut out and color one or two flowers, possibly print their initials on it, and glue it on the group wreath.